It’s important for me to lay all this out in the beginning because this feeling of trust going into the unknown was, at least from my perspective, the prevailing emotion at last night’s show. It also turned out to be the subject of most of the lyrical content for this new project. Probably unusual for a recap of something Phish-related, I want to start with those lyrics, because I can already feel the furor of a certain contingent of Phish fans starting their engines, ready to lampoon the two hours of new Positive Energy Trey music. But to dismiss this new project as simply Soul Planet: The Band is to miss the (ghosts of the) forest for the trees. Yes, the "Ocean of Love" does make an appearance and the music is sprinkled with other platitudes that some of us will cringe at, and maybe rightly so. But what made last night’s show so much more emotionally complex than some of the writing that’s been creeping into Phish (I’m mostly thinking about “Set Your Soul Planet Free”) is that the lyrical content is only doing a small part of the band’s emotional work. Tied to these lyrics are upwards of a dozen inventive (for the most part) songs that tie these lyrics to soundscapes that complicate the text. There’s one piece that sounds like if the Baker’s Dozen “Drowned” was a song, a handful of tunes that wouldn’t sound out of place on the record of your favorite indie rocker, one or two legitimately angry ragers, and a couple of creative, surprising, instrumental composed sections. My point here is that the encouraging lyrics that Trey put out last night do not exist in a vacuum. It’s not soulful optimism for soulful optimism’s sake. Rather, the music tells us that maintaining this kind of perspective through the emotional tumult of grief and sobriety is beyond difficult – that difficulty, rather than the positivity itself, is the band’s subject. So what about the music? If you’re here for a song-by-song recap, I can’t really help you. Part of me didn’t think it was possible (you know, with the whole not-knowing-any-of-the-song-names thing) and part of me didn’t want to stand in the middle of this new thing with a notebook, taking notes on Tony’s fills (which were turned way too far down, by the way), and not paying attention to the totality of what’s clearly an emotional night of music. I think this was a good decision, but I do want to point out a couple of highlights to give folks an idea of what this thing is. The show begins, house lights up, with a piano overture. It’s a simple melody, and a pretty one, but to me it set up the idea that this isn’t really a collection of songs; it’s one unit, almost one argument. The second and third songs (“Drift While You’re Sleeping” and “Friend”) were the musical highlights of the night for me. “Drift” is one of those “Surprise! This song is complicated!” tunes; when it starts up, it doesn’t feel too remarkable, but then Trey guides us into an instrumental section (that is brilliantly supported by everyone’s favorite regular-clothes-wearing drummer, Jon Fishman) that feels like a mix between “Petrichor” and “Horn” – it has these guitar runs that fill in the gaps from movement to movement, but it also has an internal logic that it establishes and almost immediately subverts; the result is both beautiful and joyful. This composed section gives way (if I’m remembering correctly) to a nice lil funk section, a reprise of the instrumental section, and then a big, four-chord power-ballad closer. It’s a weird piece of music, but every twist and turn begs to be followed. “Friend,” on the other hand, is more simple. Starting off with a bluesy guitar riff, this song is a reflection on Chris and what he means to Trey. The best I can do is frame it almost like a revisiting of “Miss You,” at least in terms of tempo and theme, with a new, still David Gilmour-y guitar solo. It’s that solo that delivered “Friend” for me. You can hear the emotion pouring out of the guitar. “About To Run” is not Trey’s 2020 announcement---at least, not yet---but is instead a really high-energy rocker complete with another top-notch guitar solo. (Lot of great guitar solos by that redheaded fella last night.) It did feature a strange lighting choice; behind the band, there are three vertical panels and then what’s essentially a curtain of LED lights. During most of the show, these lights lit up in fun patterns in time with the music. During “About to Run,” these lights somehow mirrored Trey’s movements, creating a massive, LED Trey behind the band. 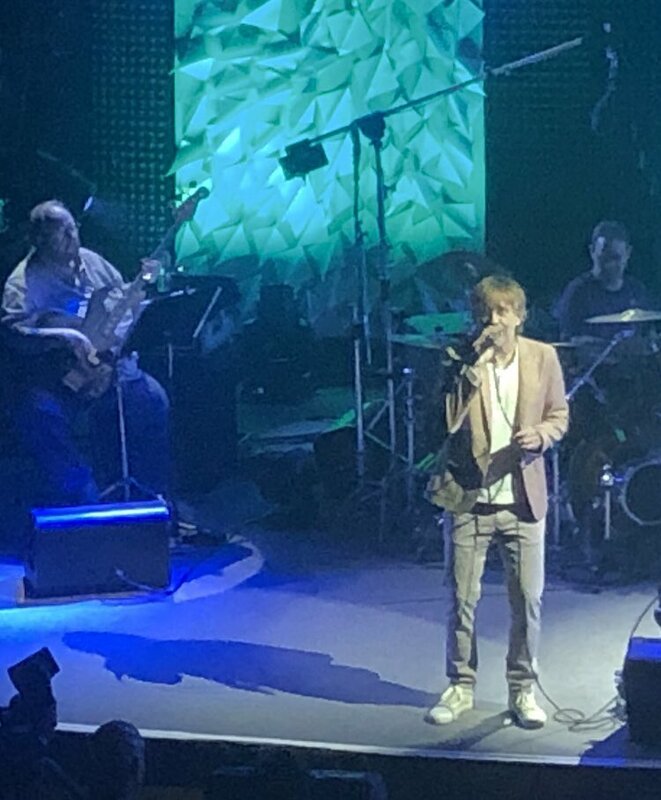 It was strange partially because the panels obscured Big Trey for much of the song, but also because it felt a little too Big Rock Star for what was an intimate evening otherwise. Speaking of lights and choreography, there was one downright strange moment where Celise and Jen left the stage for a moment and returned, standing on opposite sides, singing and each holding a small, glowing cube. (Only two cubes total. No word on where the seven remaining cubes are.) But then they took their cubes back and just walked back to their regular places and the show continued. I’m going to guess that there’s something in the thematic content of the moment that allowed this to make sense, and that I missed it in my first time hearing this music, but it was a bizarre moment, especially for the middle of the set. Of course, everyone knows that one can’t review Ghosts of the Forest without mentioning “Beneath a Sea of Stars,” which, over its two stretches, added up to twenty-five minutes of music. It’s a complex piece and all of its twists and turns can’t be catalogued here. To me, it’s more “Mercury” than it is, say “Guyute” or “Fluffhead.” There’s not too much in the land of full-band, classical-feeling-through-composed music in this song; rather, it relies on a series of themes that reprise in the context of what feels like more standard rock songs. There is one gem of a moment, in the first part, that basically feels like the “Mercury” bridge’s evil twin---something of a mix between a haunted house and an alien invasion. If it was a movie, it would be Knowing, starring Nicholas Cage, but good. But by far the strangest moment of the song, is the section after this bridge, which sounds exactly like “Pigtail,” and everybody in the band played it pretending that they didn’t just throw one of the most generic songs in Trey’s catalogue at the end of this very strange soundscape. 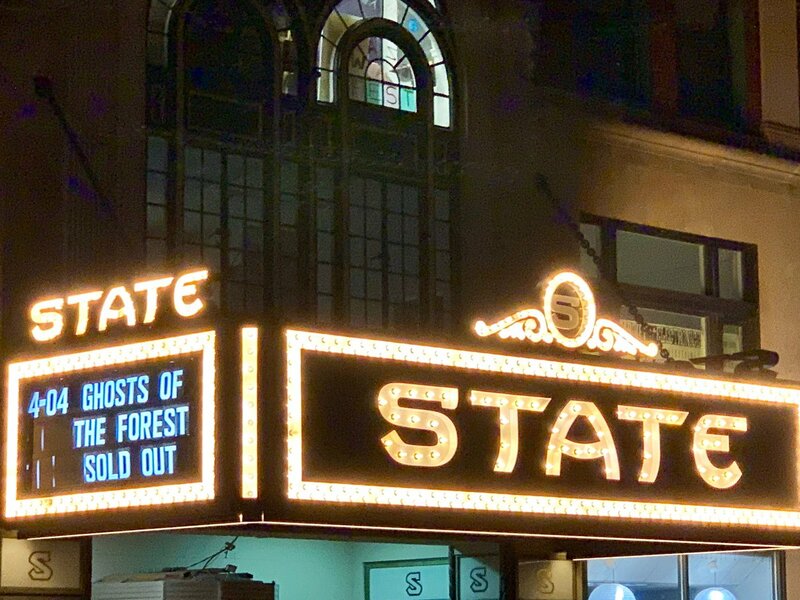 So what’s Ghosts of the Forest like? It’s a Trey project for sure, not a band that Trey is in. Each band member (particularly Fishman) leaves their own mark on the experience, and there’s plenty of room for great interplay among the band. Trey threw more and more leads to Ray as the night went on, and Ray always delivered, and jams got exploratory without getting out there. Celisse and Jen’s vocals were spot-on, with the former taking a couple of ripping vocal solos. But more than anything else, Ghosts was a unified evening of music. While there are some songs that I liked more than others (you can bet that I’m giving “Drift While You’re Sleeping” a bunch of listens today) the whole thing needs to be taken together for the expression that’s at the heart of this thing to hold. The emotional space from which Trey wrote this music is complicated and often conflicting; the only way to do right by that complexity is to experience the whole thing, together. This is mostly spot on to me. Great receptive audience last night. Seeing two and half hours of new music can be a trying experience and I'd say the audience was more receptive to this than the Wingsuit set or even Kasvot Vaxt. Trey could clearly feel it and I'm glad I made the drive up. While you may be right that this material is more emotionally and musically complex than the Soul Songs and their ilk, I think the recent Phish stuff works better on the stage because of it's simplicity. The GOTF material was sometimes overwrought lyrically. I think if he's going to be so literal in his songwriting I almost prefer the direction he's been going with Phish (a few short verses and an uber-catchy chorus). Interested to see how the rest of the tour goes. I listened to 4/4 as soon as I could. I had 4/6 tickets that made it into good hands. I just couldn’t imagine myself simply HAVING to make it to that show, but the music they played came as close as it was going to. Which is to say superb. Emotional. Wholly untechnical. Trey stayed out of his own way in the best sense. If you have tickets, go. Thanks! I'm seeing the 4/13 show and I don't want to listen to anything, besides the title track that was released, before I go. Reading all the opinions and this review is as close as I'll let myself to the music beforehand, and I really enjoyed reading this. Very excited for next Saturday.